This tutorial shows you a Spring MVC Excel Pdf ViewResolver Example by using Spring MVC Content negotiation to generate multiple views of the same resource. It means that this example will generate a excel view (.xls or .xlsx format) or pdf view. We need to use the following dependencies that supports to create excel document and pdf document. We are using the configureViewResolvers method to register the views such as XlsView, XlsxView, XlsxStreamingView and ItextPdfView. 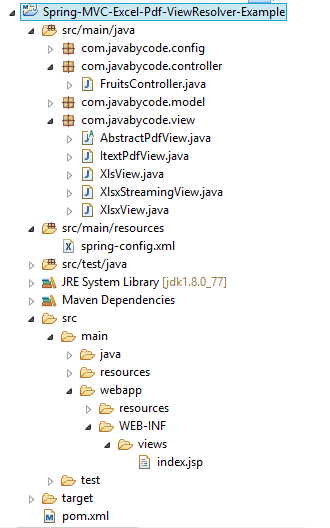 This is the same Spring XML configuration as above. Notices: we need to use the DispatcherServlet to mapping the request to the correct controller methods. It is the same DispatcherServlet of the previous Spring MVC so it is not mentioned here or you can see it in the source code attachment. This Fruit POJO is used to add data to the Excel and Pdf document. 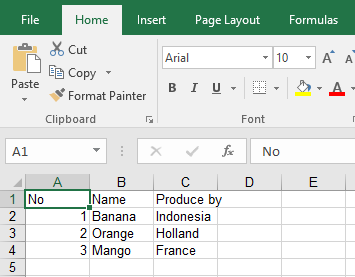 The FruitsController is responsible to create list of Fruit elements for Model which be used to display on the Excel and Pdf document. The Excel document is with 2 extension format, the .xls is the old format and the .xlsx is the new foramt. The apache POI library is responsible to create excel files. The XlsView is extended from AbstractXlsView. Then we override the buildExcelDocument method to create the excel document. Instead of extending the AbstractXlsView, the XlsxView is extended from AbstractXlsxView. The rest part of XlsxView implementation is the same XlsView above. If you need to process large excel documents you should use AbstractXlsxStreamingView. The StreamingView will improve the performance of large documents. Notice that some clients are incompatible with this streaming way. So you should consider to use. The new com.itextpdf:itextpdf library is not supported by default. We will create an abstract class and extending from the AbstractView to resolve this issue. The abstract class should be implemented such as below. The buildPdfMetadata and buildPdfDocument methods are responsible to create the Pdf document. And the renderMergedOutputModel(..) method are responsible to write the pdf document to the response. Then, we need to create new class ItextPdfView that extends from the AbstractPdfView class and override the buildPdfDocument method to create the real pdf document. The text/html is the default view and this view will be displayed using the same URI. That’s it on how to create Spring MVC Excel Pdf ViewResolver Example. The next post will show you how to view JSON and XML using Spring MVC Content negotiation.